For all the support our Run Club members have been giving us, the Running Room wants to give something back to you. We've included a rewards program. Find out more! As a Running Room Rewards Club member, you earn Rewards points for every purchase you make. The greater the purchase, the more points you earn. You don't have to spend a minimum amount to qualify for your Rewards points. When you are a Running Room Rewards Club member, every dollar you spend earns you ten Rewards points. For every 5000 points collected, we will send you a Running Room Rewards Certificate good for $10 off any future purchase. As part of our ongoing effort to reduce our environmental impact, Rewards certificates will now be available as virtual gift certificates that can be redeemed online or at retail stores. Rewards certificates are sent electronically via the email address provided on your profile. Remember, provide you phone number every time you make a purchase to earn your points. Points are accumulated on every purchase. For every dollar you spend, 10 Running Room Rewards points are earned. Ten Rewards points are earned for every dollar spent, exclusive of applicable taxes. Upon earning 5000 points, a $10 rewards certificate will automatically be sent to the email address provided. Running Room Rewards may be used to purchase any merchandise in any Running Room location. 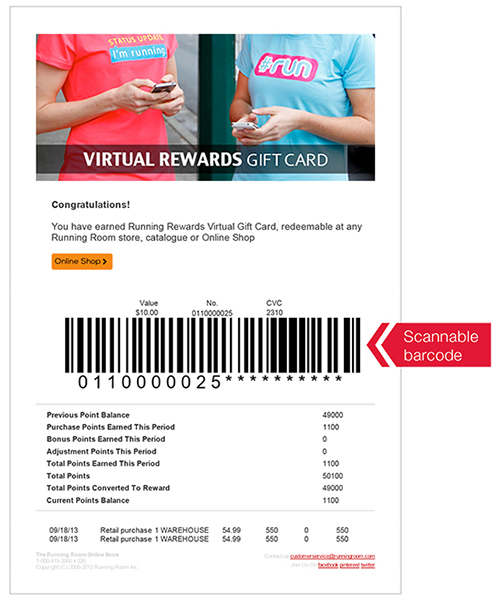 Running Room Rewards points have no monetary value, are not transferable and cannot be redeemed for cash. Membership is valid in Running Room locations and is not transferable. All member information will be used solely by Running Room Sports Inc. and will not be sold or rented to any other organization. Full name, address, email address, and telephone number must be accurately entered on the enrollment form to receive earned Rewards and Program benefits. * Program rules may change without notice. This program may be terminated without advance notice.